iManila Hosting Review 2019: Is iManila Hosting a Good Hosting? iManila Hosting is a hosting service based in the Philippines with decades of online presence in the market. Their offer is leveling the industry average, good enough to suffice the needs of bloggers, small, and medium business owners. iManila Hosting is a Philippine-based company with more than 20 years of experience in the web hosting industry. They have successfully gained a good reputation by providing reliable online services with the main focus on scalability and stability. This company offers everything from domain name registration, shared and dedicated hosting plans to SSL certificates and VPS hosting solutions. For your successful online business, everything starts with choosing the right domain name and registration and what’s interesting is it is provided completely without charges by this company including free DNS service for a lifetime and free domain forwarding which allows you to point your domain name to another website and easily redirect users. iManila Hosting offers various packages for email and web hosting and provides you with everything from solutions with simple hosting for personal websites to high-performance dedicated servers suitable for larger businesses and organizations. Their VPS hosting is a financially lighter option that provides you with services similar to fully dedicated servers but for a significantly lower price. They have various hosting plans listed in Shared web hosting with their most tempting offer providing 20GB of disk space and 100GB of bandwidth. Additionally, there is WordPress hosting, and only one plan included in the VPS web hosting package. There are no available free SSL certificates which is almost standard these days in the web industry. Their services are delivered through first-class hardware that guarantees maximum reliability, flexibility, and scalability along with powerful and customizable third-party add-ons. They offer a 99.99% uptime guarantee and available managed support for all their services along with a 30-day money back guarantee in case you weren’t satisfied with their features. iManila Hosting lists prices in Philippines Pesos, so to fully understand how much you are paying, you should use an online money converter. Their pricing is normal for standard services offered on today’s market. This company accepts multiple paying methods and offers only an annual billing plan without discounts. Online support is available through a phone service 24/7/365 and a mail service with a response time of an average of 20 minutes and almost 30 minutes during peak hours. Their support team members are highly professional and polite with answers to all your questions and always at your disposal. 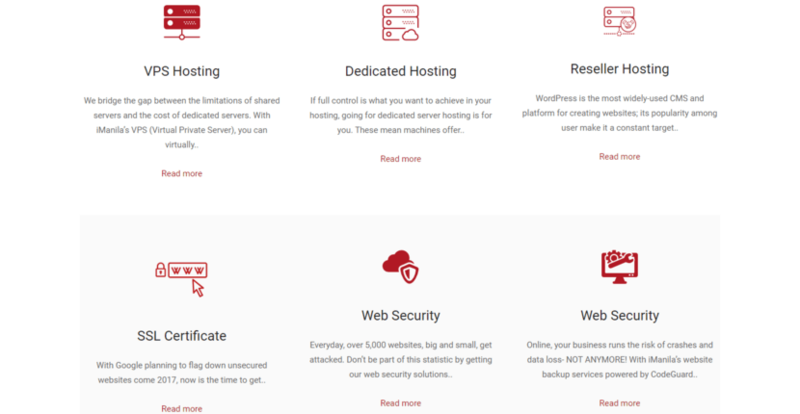 iManila Hosting, as one of the pioneers in the hosting business in the Philippines, stands as the reliable provider of a wide range of stable, and scalable solutions. I found their services highly recommendable with genuine features included and delivered through first-class latest technologies so your online business can thrive without obstacles. This company offers everything you need for your web presentation from simple hosting to dedicated hosting designed for big corporations and large-scale businesses. Wondering how iManila Hosting stacks up against other Web Hosting companies? Enter any other Web Hosting company and we will give you a side-by-side comparison.